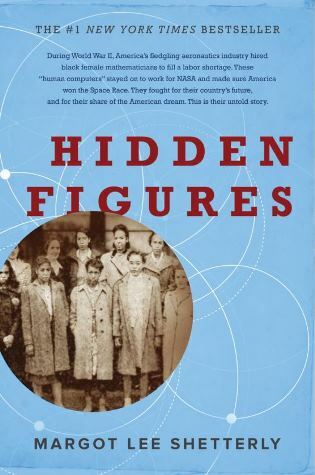 This year's Town-Wide Read is Hidden Figures by Margot Lee Shetterly. As the United States geared up for World War Two and then for the Cold War and the race for space, it was soon evident that relying on white males to fill the jobs was not going to be enough. This opened up the science, technology, engineering and mathematics (STEM) fields to women of all races and minority men. In Hidden Figures, Shetterly takes us to Hampton, Virginia and Langley Research Center where women were given the opportunity to use their minds and their skills to help in the war and space efforts and showed us that STEM was not just for men. Why was this book chosen? The times are changing and jobs are changing with them. For our country to prosper, we will need everyone to be technologically literate and to be supported and encouraged in their interests in the STEM fields. Here's the outlook from the Bureau of Labor Statistics. The books are available at the library to borrow as well as through the SAILS system. Here are some discussion questions to think about as you read the book. The Jet Propulsion Laboratory recently discovered a cache of audio tapes from a long time ago and digitized them. You can access some of them on YouTube. There are also some fascinating activities for students (AND ADULTS!) at the NASA site. One shows the math involved in calculating Launch Windows. Friday, March 23, at 7 pm at the Chorney Property, Ellis Road, North Attleboro. Join Andrew Galasso, member of the Astronomical Society of Southern New England for a Winter Moon-Viewing party and learn the joys of astronomy. Some other objects we will be able to observe are the Pleiades, Hyades, and Beehive star clusters, the Orion Nebula, and perhaps galaxies M81 and M82 if the sky conditions are good enough. This is appropriate for older elementary children through adults. There is parking at the property, which is at the intersection of Ellis Road and Metcalf Road. Wednesday, March 7 and 21, at 3:30 pm: Explore the fun of math through activities. For children 9 years and older. Registration required and starts March 1. Saturday, March 17, at 10 am in the Program Room: Children 9 years and older are invited to build and learn about using foldscopes which are origami-based, pocket-sized, portable microscopes. Registration begins March 1. Saturday, March 24, 10 am to 1 pm: Drop by the Childrens Room to make space environments for the Women of NASA using Legos. Wednesday, March 7, at 6:30 pm, at the Library. The Space Race: Race for the Moon , presented by Professor Joe Doyle of Bridgewater Community College. In 1969 men from Earth walked on the surface of our next nearest neighbor, the Moon. The journey began as a competition between two superpowers but became, if only for a short time something greater. This talk parallels the reasoning behind the space race with the technical accomplishments and human achievements that occurred at the same time. Thursday, March 22 , at 6:00 pm at the library: Death Dive to Saturn, a NOVA program which features the Cassini probe and many women scientists who were involved in the program. Read or listen to an interview with Linda Spilker, Project Scientist for the Cassini mission. Learn more about the Cassini mission on the NASA site. Hear from some of the scientists at the end of the mission. Professor Joseph Doyle is the Observatory Curatorat Bridgewater State University and a member of the Physics department. His classes are very popular with his students. Andy Galasso is Vice President of the Astronomical Society of Southern New England. ASSNE was founded in 1995. This group of amateur astronomers observes and socializes together and provides community outreach on all things astronomy in Rhode Island and Southeastern Massachusetts. They have visual observers and star hoppers, asteroid and comet hunters, sun/moon/planet enthusiasts, telescope/observatory builders, and astrophotographers. Above all, they have one thing in common; a passion for astronomy. Their club motto is to educate and inspire, and they strive to do that on a continuing basis. Dr. Cynthia Carter is a psychiatrist currently practicing at Harvard University Health Services and is affiliated with Boston Medical Center. She is a graduate of Howard University and a member of Alpha Kappa Alpha, both of which are featured in the book, Hidden Figures. Sorry. Jodi has a work conflict and can't make it. Jodi Perron's dream as a young girl was to work for NASA, but she did not receive any encouragement for her ambitions. It wasn't until 1994, when she was married with children and working fulltime, that she started taking classes at the Community College of Rhode Island (CCRI.) In 2012 Perron was accepted to the National Community College Aerospace Scholars program, a highly selective program that brings applicants from all over the country to the Johnson Space Center in Houston or the Jet Propulsion Laboratory in Pasadena, CA, to work with NASA engineers on a mock space exploration project. She graduated in May 2012 with a degree in Computer Programming and a 3.9 GPA. Her NASA experience inspired her to continue her education in the sciences. "I started my dream career as a Software Developer in 2013 shortly after graduation. I am still designing and maintaining health care information systems today." Frank Puglia, a Rhode Island native and URI Chemical Engineering graduate, has over 20 years experience in the design, development and production of energy storage systems for advanced applications ranging from the Mars Rovers, Landers, and Science Laboratory, to batteries for the next generation of fighter aircraft. During this time he has authored and coauthored numerous papers with various NASA and Air Force researchers. Mr Puglia also has an extensive history in promoting STEM topics at local schools and organizations. This is accomplished through hands-on, build-your-own education sessions covering Energy, Electricity, Robotics, Geology and Space. Other panelists include a Sensata Technologies Inc., Engineer and STEM Advocate: Hear from an engineer at Sensata Technologies in Attleboro. Learn how she supports the success of girls and boys in STEM by providing opportunities to deepen their understanding of STEM concepts, explore career opportunities, and develop leadership skills. Find out what inspired her to become and engineer and how she supports STEM initiatives in the community and at Sensata and what you can do to support STEM success. Also an area student will share her experiences at the 2015 Envision the Future Program held at Bridgewater State University, July 20-24, 2015, and with the Sensata STEM Mentoring Initiative that have provided her with opportunities to engage in computing and engineering activities and explore career options with STEM professionals. She will illustrate why it was important for her to be exposed to STEM in middle school and why we need to begin when children are young to ensure STEM success. In addition, she will share how her work with a STEM Community Team has enhanced her leadership skills through planning for and presentations at STEM events.